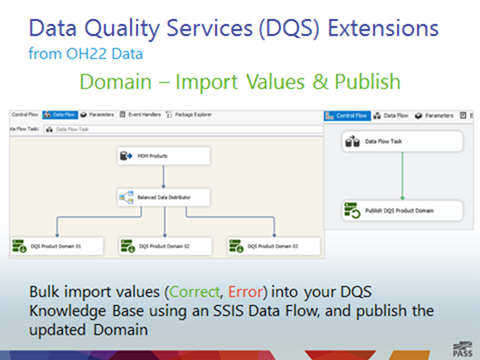 A new OData Source for SSIS is now available. 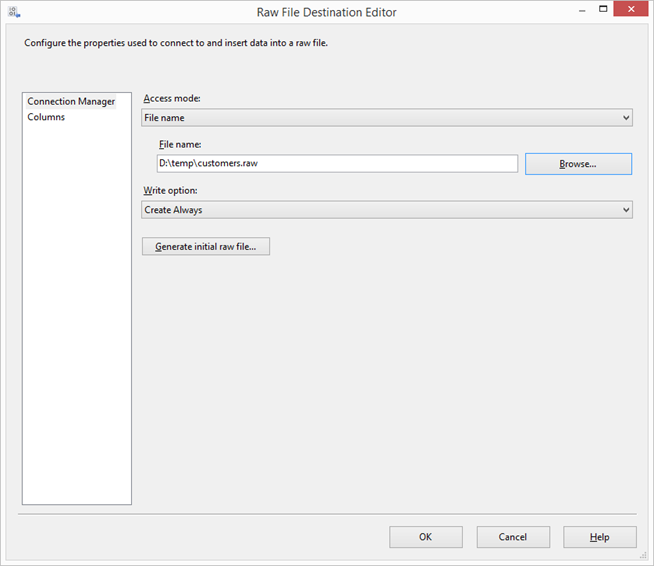 The 2012 version is available as a standalone download, and the 2014 version is part of the SQL Server 2014 Feature Pack. The documentation for the 2012 is available in Books Online. The SSIS team blogged about executing packages deployed to the SSIS Catalog using DTEXEC a while ago. The post mentions the $ServerOption::SYNCHRONIZED parameter as a way to control whether the execution is synchronous or asynchronous, but there are some other server options you can set as well. Phil Brammer actually blogged about the options last year. You can also see the full list of options when you view the SSIS Catalog Execution report (note the Parameters Used section in the screenshot below). More information on logging levels can be found here. Each entity in SQL Server 2012 Master Data Services (MDS) will have it’s own staging table (stg.<name>_Leaf). Using this staging table, you can create, update, deactivate and delete left members in bulk. 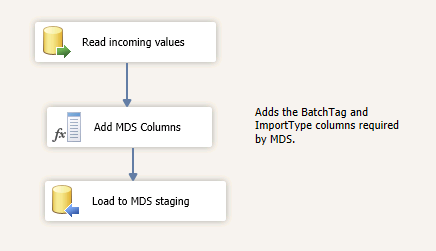 This post describes how to bulk load into an entity staging table and trigger the stored procedure to start the batch import process. 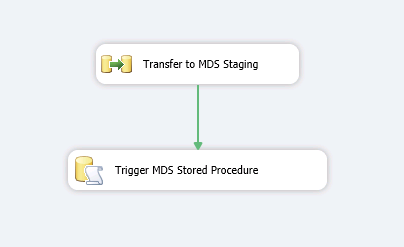 The new entity based staging tables are an excellent feature in MDS 2012, and make it very easy to bulk load into MDS from SSIS. If you take a look at the SQL database used by your MDS instance, you’ll see at least one table in the stg schema for each entity. 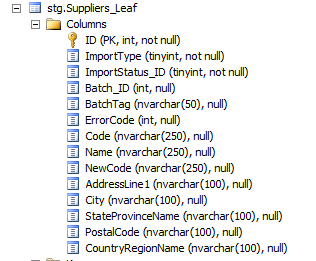 For this example I’ve created a Suppliers entity and I see a matching table called [stg].[Suppliers_Leaf]. If your entity is using hierarchies, you will have three staging tables (see BOL for details). If we expand the columns, we’ll see all of the attributes have their own columns, as well as some system columns that every staging table will have. Each staging table will also have a stored procedure that is used to tell MDS that new data is ready to load. Details of the arguments can be found in BOL. See the Leaf Member Staging Table BOL entry for details on the remaining system columns. If your Code value isn’t set to be generated automatically, then you’d also need to specify it in your data flow. Otherwise, the default fields can be safely ignored when we’re bulk importing. The BatchTag column is used as an identifier in the UI – it can be any string value, as long as it’s unique (and under 50 characters). MDS uses the same staging table for creating, updating and deleting entities. The ImportType column indicates which action you want to perform. The possible values are listed in the table below. 0 Create new members. Replace existing MDS data with staged data, but only if the staged data is not NULL. NULL values are ignored. To change a string attribute value to NULL, set it ~NULL~. To change a number attribute value to NULL, set it to -98765432101234567890. To change a datetime attribute value to NULL, set it to 5555-11-22T12:34:56. 1 Create new members only. Any updates to existing MDS data fail. 2 Create new members. 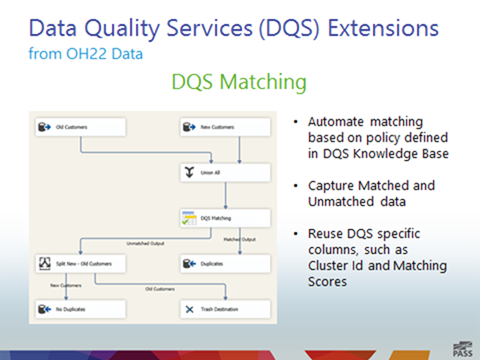 Replace existing MDS data with staged data. If you import NULL values, they will overwrite existing MDS values. 3 Deactivate the member, based on the Code value. All attributes, hierarchy and collection memberships, and transactions are maintained but no longer available in the UI. If the member is used as a domain-based attribute value of another member, the deactivation will fail. See ImportType 5 for an alternative. 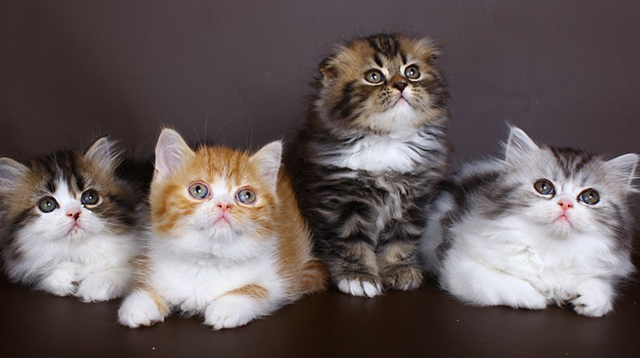 4 Permanently delete the member, based on the Code value. All attributes, hierarchy and collection memberships, and transactions are permanently deleted. If the member is used as a domain-based attribute value of another member, the deletion will fail. See ImportType 6 for an alternative. 5 Deactivate the member, based on the Code value. All attributes, hierarchy and collection memberships, and transactions are maintained but no longer available in the UI. If the member is used as a domain-based attribute value of other members, the related values will be set to NULL. ImportType 5 is for leaf members only. 6 Permanently delete the member, based on the Code value. All attributes, hierarchy and collection memberships, and transactions are permanently deleted. If the member is used as a domain-based attribute value of other members, the related values will be set to NULL. ImportType 6 is for leaf members only. The difference between 0 and 2 is the way they handle NULLs when updating an existing member. With 0, NULL values are ignored (and require special handling if you actually want to set a NULL value). With 2, all values are replaced, even when the values are NULL. Use 1 when you are only inserting new members. If you are specifying a code, then a duplicate value will cause the import to fail. As noted above, in your OLE DB Destination you’ll need to map your data flow columns to your member attributes (including Code if it’s not auto-generated), the BatchTag value (which can be automatically generated via expression), and the ImportType. After the Data Flow, you’ll run the staging table stored procedure. EXEC [stg]. [udp_Suppliers_Leaf] ?, ?, ? Yes, yes you can. 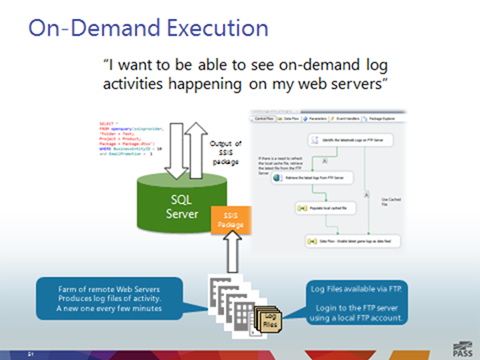 Scripted or automated deployment can be done in a number of ways in SQL Server 2012. Yes, this is the primary UI tool for SSIS project deployment, but it can also be run silently on the command line. When you run through the wizard, the Review page will actually list all of the parameters you need to do the same deployment from the command line. Run ISDeploymentWizard.exe /? from a command prompt, and you’ll see the full list of arguments it supports. The SSISDB [catalog] schema has a number of public stored procedures, including one that can be used for deployment. We even provide samples on how to use it in Books Online. All SSIS Catalog operations can be automated through PowerShell. I previously blogged about a deployment script I use to setup my demos. The SSIS Catalog management object model (MOM) exposes a set of SMO classes you can use to code your own catalog utilities. You’ll want to use the CatalogFolder.DeployProject method to do the actual deployment. If SMO or .NET isn’t your thing, you can also code a custom utility which interacts directly with the T-SQL API. 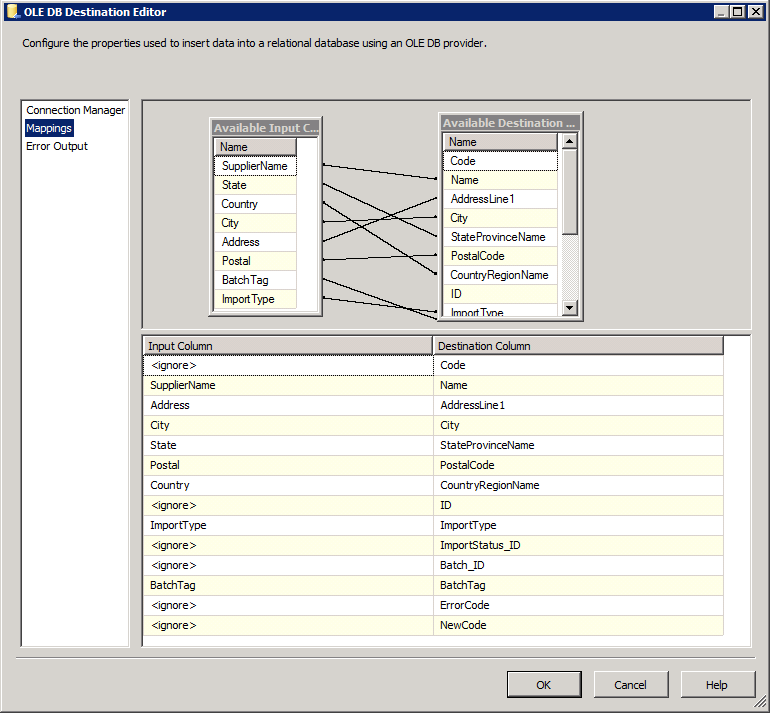 Author MattPosted on May 16, 2013 Categories SQL ServerTags Deployment, SSIS, SSISDB3 Comments on Can I Automate SSIS Project Deployment? 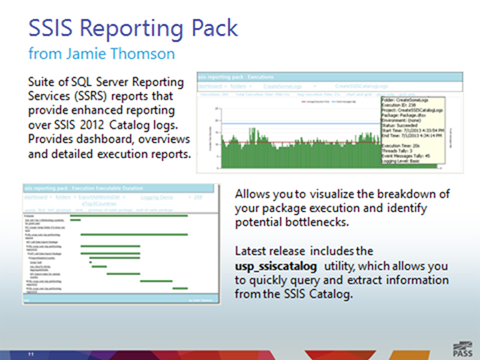 I put this together for an SSIS performance presentation I did a while ago, and thought it warranted its own post. 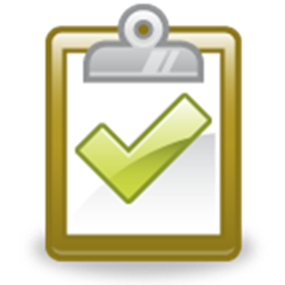 In addition to looking for appropriate Design Patterns, I have a checklist of things to look for when trying to optimize an SSIS Data Flow. This list is by no means extensive, but it contains some of the more common causes of performance issues in the packages I’ve worked with. Can you remove the OLE DB Command transform? OLE DB command operates on a row by row basis. Stage the data and perform the operation in a batch mode using the Execute SQL Task instead. Can you replace Upsert logic with a MERGE statement? Learn MERGE, and love it. Do you need those Sort transforms in there? Sometimes you do. Most of the time you don’t. If you do need them (i.e. you are loading from a flat file, and need to do a merge), considering maxing out the DefaultBufferMaxRows setting so you can sort more data in memory (sort will keep at most 5 active buffers in memory before it starts swapping to disk). Can the lookup be avoided? Are you using the right cache mode? Should you use a Cache Connection Manager? Lots of related lookup posts can be found here.